I thought I’d try to channel my grandma’s spirit – I pulled out her old knitting needles and found some yarn. Growing up, I spent lots of time sitting next to her while she knitted. Scarves, hats, sweaters, blankets… you name it, she could do it. Her knowledge was self-taught, too. She used to tell me stories about how she learned by watching other women knit in the marketplace, and then practicing on her own with a pair of chopsticks. Talented woman. My stitches are nowhere near as even, neat or nice as hers. I gave this scarf my best shot, and I can tell where I held the yarn too tight, too loose, and sometimes just right. I should have spent more time picking her brain about proper knitting technique. This scarf took me about four or five days of work. I found it to be a meditative and therapeutic experience. There was something about getting into a certain rhythm of knitting that I liked – the consistent tink-tink of the needles hitting each other, feeling the texture of the yarn in my fingers, getting lost in my thoughts while my fingers worked, admiring my progress as I went along… It was calming. I find that I enjoy doing activities whose results are tangible; it’s a nice break from my abstract, mind-numbing regular duties. Note: There is no image of this scarf because it is 100% hideous. One of my childhood dreams was to be a radio DJ. Let’s leave it at that. It’s finally done… I finished this little puppy in July 2016. I was stitching for days, I tell you… days. So how long did this take me, from start to finish? I think I started this in the summer of 2012 – 4 years from beginning to end. Yikes. And the only reason it got finished was because we were relocating abroad, and I couldn’t bear to leave this unfinished in the States. It was so much work to finish this thing, I need to recover a little before I even think about starting a new one. Final dimensions: 67 x 89 inches, about right for a twin sized bed. It was going to be a queen sized quilt, but I was worried it wouldn’t fit in my luggage. I’ve decided to give Castile soap another go. This is similar to the first Castile soap I made, but I’ve readjusted a few of the ratios. Last time, the soap reached trace extremely slowly, which is typical of pure olive oil soaps. This time, I thought I’d try using the last of my Honey & Patchouli fragrance oil, which seemed to accelerate trace the last time I used it. My soap riced right away, but other than this cosmetic defect, I think it will be fine for using (based on this resource). Whoops. I was going to swirl this soap, but that was going to be too tough to do once it had riced. Essential oils are so much better behaved than fragrance oils. And afterwards, I was looking up soap mishaps, and it turns out my soap could have been much, much worse. For instance, it could look like this. 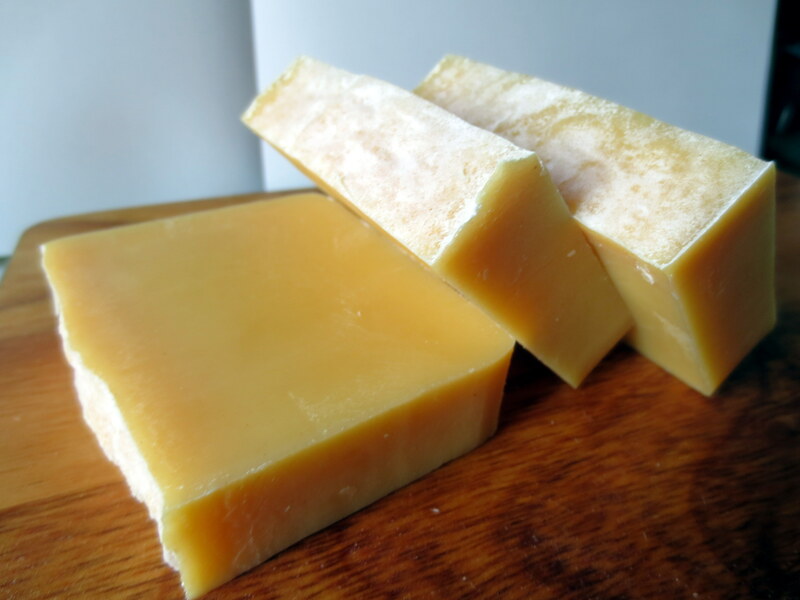 Next time, I think the better way to make soap using this Honey & Patchouli FO is by stick blending the olive oil + lye solution to trace, then pouring the FO into the base, and stir by hand slowly. 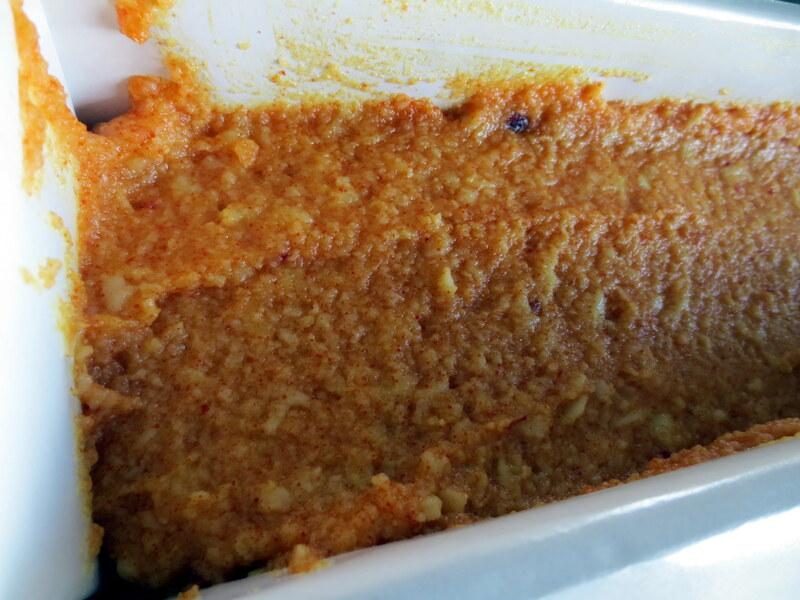 As soon as it looks like it is about to rice, pour it in the mold. Mix the lemon peel powder with the warm water. Stir well and set aside. Make sure this container is about half as large as the main mixing bowl. We will mix half of the soap base with the lemon peel powder. Combine the scented oils and olive oil. Carefully pour the lye water into the oils. Gently stir with a heat safe rod. Pulse the stick blender in the mixture a few times, and then gently blend until just before you reach trace. Mix the lemon peel powder with the soap base. I tried my first batch of swirled soap this weekend, using this video as a resource. My recipe is a bit different than theirs, since I like to focus on natural pigments and essential oils. 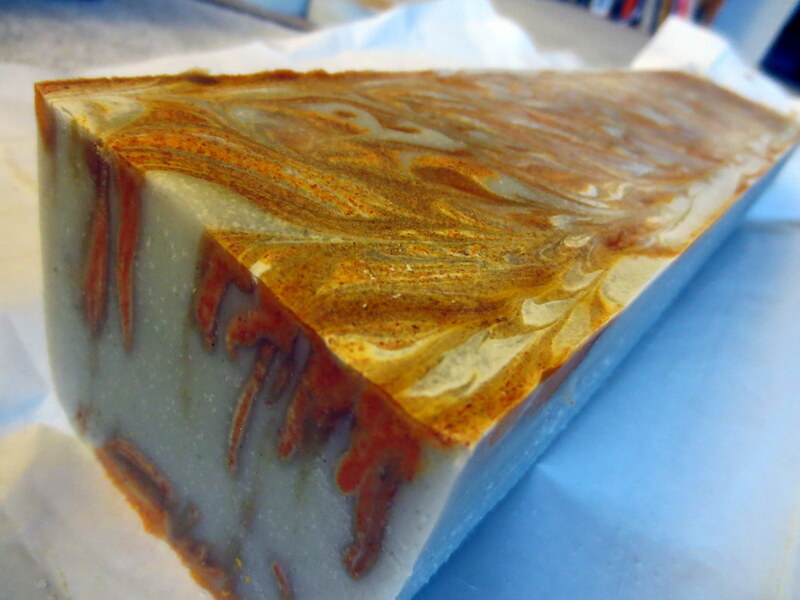 This soap is a blend of olive oil, coconut oil, sunflower oil, and safflower oil. I added some bentonite clay, which colors the soap green and retains moisture in the final product for a more moisturizing bar, and tumeric, for its exfoliating and beneficial effects on skin (prevents acne by reducing oil secretion, encourages scars to heal). It also makes a nice orange-brown color in soap. Again, since this is mostly olive oil, we have to cure for 4-6 months. This recipe is for 5 pounds of soap. Extremely gentle and conditioning in soap. Provides cleansing ability to a bar of soap. It is mild and moisturizing. Can be prone to rancidity; proper storage is a must. It provides stable lather, conditioning, and a silky feel to soap. Sunflower oil naturally resists rancidity due to its high vitamin E content. When the lye solution is close to 110F, set up a double boiler. Gently heat the oil blend to about 100F. Combine the lemon peel powder and tumeric in a separate container, which is about 4 cups in volume. Pour about 1/3 of a cup of the warmed oil blend in the container. Mix well and set aside. Carefully pour the lye water into the oil blend. Do not pour any lye water into the container with tumeric and lemon peel. Gently stir with a heat safe rod. Pulse the stick blender in the mixture a few times, and then patiently blend until you are about halfway to trace. Add essential oils. Pulse the blender to mix a few times, stopping before you reach trace. Pour the mixture in the tumeric-lemon container until it is as full as it can be, while still being able to accommodate the stick blender (I filled it about 70-80% full). Pulse the stick blender in the tumeric-lemon container until you reach trace. Add the bentonite clay to the other container. Blend to mix well. Stop when you get trace. Pour all of the green bentonite mixture in the soap mold. Starting at a high height, pour 1/3 of the tumeric-lemon mix in the soap mold. This will reach the bottom of the mold. Do the same with the second 1/3 of the tumeric-lemon mix, but at medium height. This will reach the middle of the mold. Repeat one last time, with the final 1/3 of the mix, but at low height. This will reach the top of the mold. 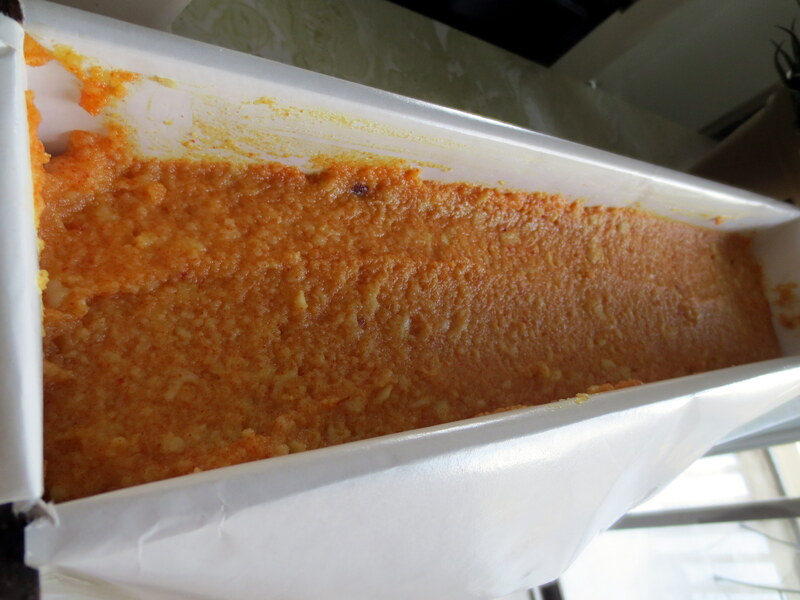 Use a rod (or the end of a spoon) to touch the bottom of the mold. 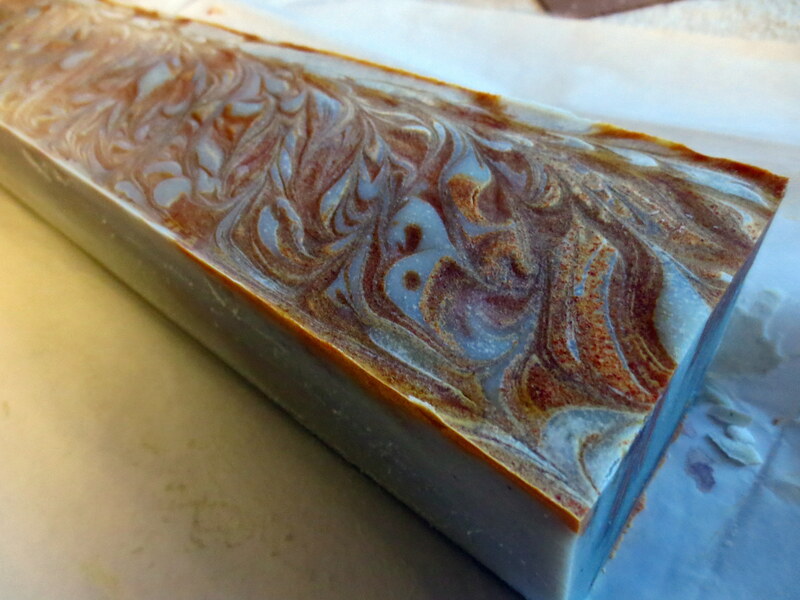 Using even and fluid strokes, draw swirls in the soap. Wait 1-2 days before cutting. After experimenting with my first castile soap, I’ve decided that it’s better to use a coconut and olive oil blend soap. The castile soap I made had some odd consistency, although it was very moisturizing and gentle. 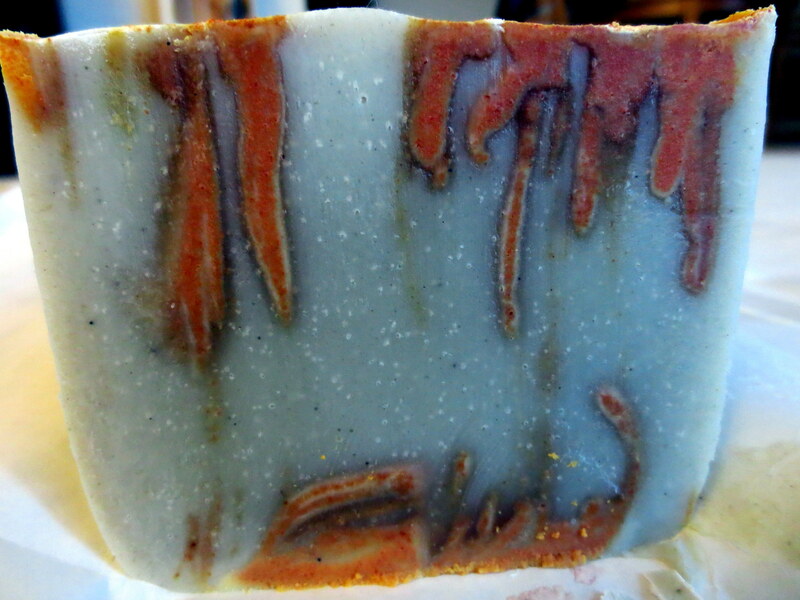 This soap is a blend of olive, coconut, and almond oil. It’s mostly olive oil, so I’m planning to cure it for a few months (as opposed to weeks). This recipe is for 5.6 pounds of soap. Combine the clay with the warmed oils. Stir gently to mix thoroughly. Carefully pour the lye water into the oils. Gently stir with a heat safe rod. Pulse the stick blender in the mixture a few times, and then gently blend until you are about halfway to trace. Add the tumeric and essential oils. Pulse the blender to mix, stopping as you reach trace.